My wife would like 100% of the credit for this creation. And for something this amazing, she deserves it. This isn't exactly a recipe I'll be sharing with you but it's a fun treat that you can create with the kids help and it makes a great gift for the upcoming holidays! Four layers you ask? Absolutely. Caramel, Butterfinger, Chocolate and Candied Peanuts. When she first described what she wanted to make, I thought she was a bit crazy, and I honestly didn't think it would be as good as she was imagining that it would be. 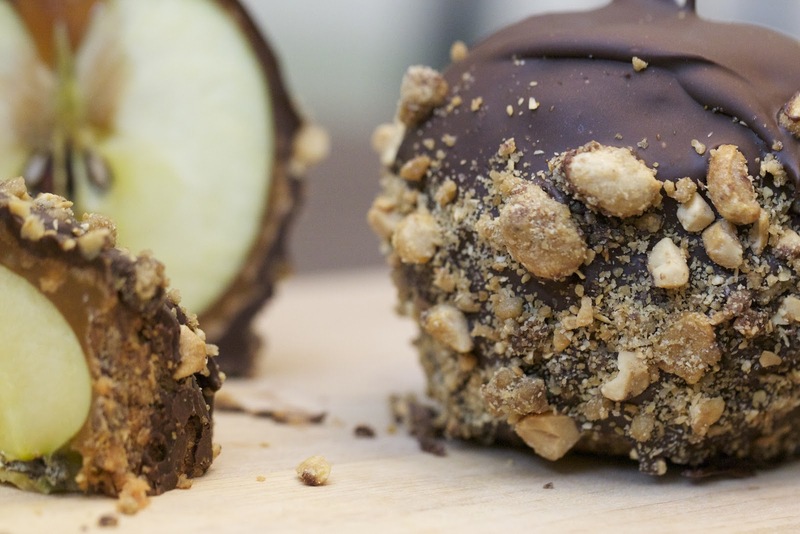 Butterfinger layer is one thing but then adding peanuts on the outside? I thought it might just be too much. And maybe it is, but it was pretty amazing. 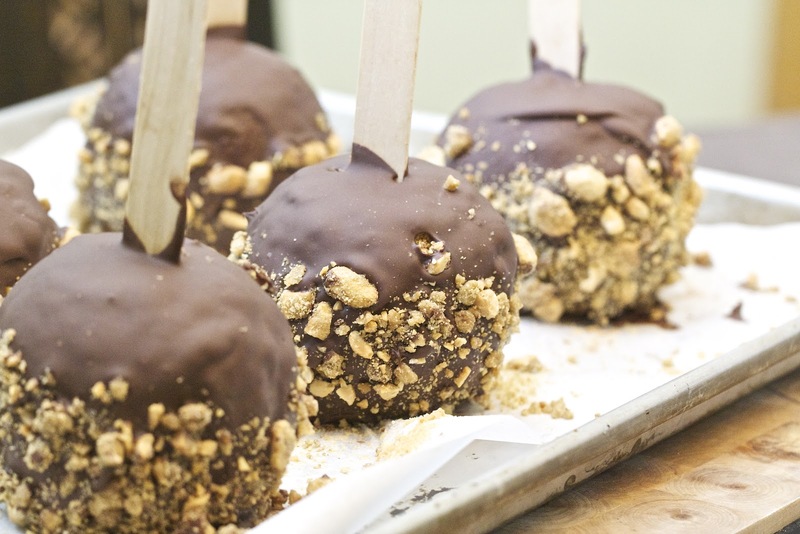 Start by melting down the caramel like you normally would for caramel apples. One bag of about 50 caramels with 2 tablespoons of water, heated on low until smooth. 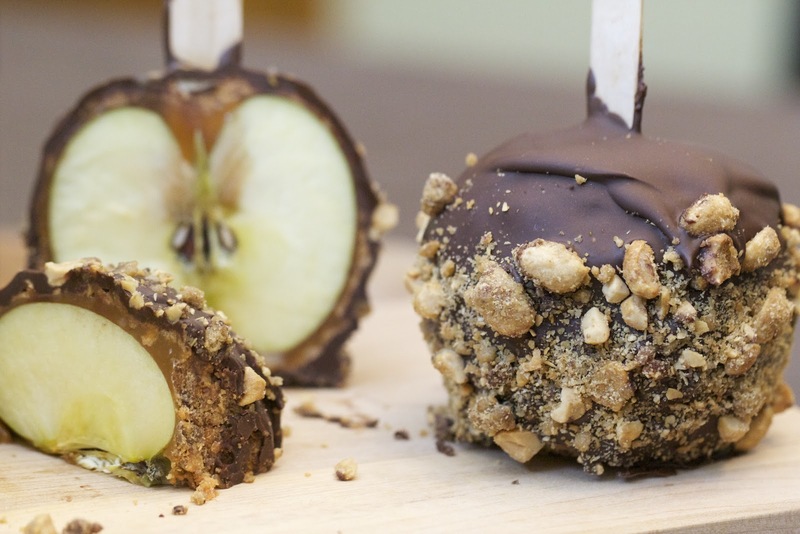 Place sticks into the apple from the stem side and dip 5 clean and dry apples in the caramel and allow the extra to drip off. 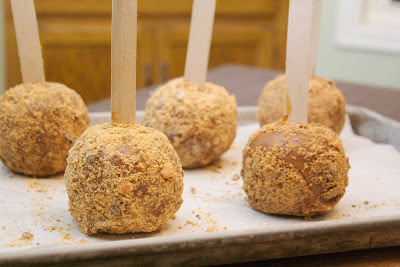 Roll them in crushed butterfinger bars, pressing in the candy to the caramel. Place them on some buttered parchment paper and freeze or refrigerate for about 45 minutes. Melt 2-3 cups of semi-sweet chocolate chips with 1-2 tablespoons of shortening until smooth. 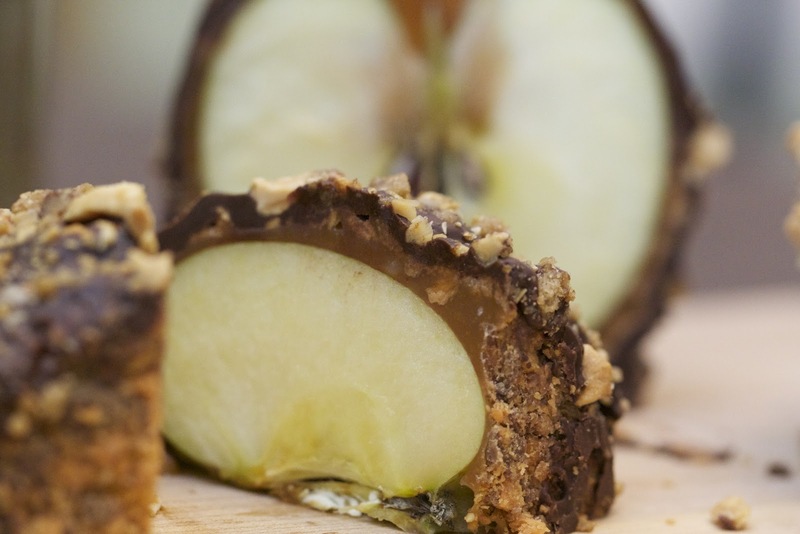 Dip the cooled apple in the melted chocolate and allow the excess to drip off. Sprinkle candied peanuts around the base of the apple and place them back on the parchment. Cool again until the chocolate has set. These are easiest to enjoy if you cut the apples in quarters and remove the core with a sharp knife. 4 layers of goodness? Yes please! These look incredible! I am so hungry for them right now.